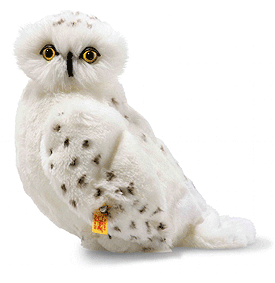 Steiff Hedwig Owl, is hand made in beautiful white cuddly soft plush and wears the famous Steiff Button in Ear, together with the classic yellow ear tag. Hedwig is Harrys devoted pet Snowy Owl and delivers any post to Harry. Hedwig is highly intelligent, extremely loyal and has an impeccable internal compass. Her favourite things to do include hunting, flying, and shes been known to affectionately nibble Harrys ear. In Harry Potter and the Deathly Hallows - Part 1.